We at Fix St Louis feel your pain and have decided to do something about it. We have a plan that, in the meantime, will give you something meaningful to do, something more interesting to stare at than TV debates, and something that will have an even greater impact on your life than the next President of the United States. We proudly introduce the Missouri Caulk-Us. Here’s how it works: First, stop watching those candidates on TV, get up from your chair, and walk to your bathtub. Now, look at the bathtub ledge. You see that once-white, once-solid hardened goop running along the perimeter? Pretty disgusting, huh? Worse yet, maybe some do-it-yourselfer in your household tried to cover it up with even more goop but didn’t have a good sense of how much to put on, or where it should go. Also, while you’re there, do you see tiles where the grout is missing, letting water into the wall, possibly rotting it and loosening the tiles? Now walk to your kitchen countertop and look at the similar white goop between the wall and either your backsplash or countertop. Is it discolored? Maybe brown, gray or black? Is it separating from the wall or countertop? Mind the gap (a little London Tube lingo there). Yes, you SHOULD be angry to be living in a house where even hardened white goop mocks your cleaning habits. You’re not going to take it anymore. And, among all their fake promises, can you believe that not a single candidate from either party is offering a federal program to replace your caulk for free? Some don’t even think you have a right to own a CAULK gun! 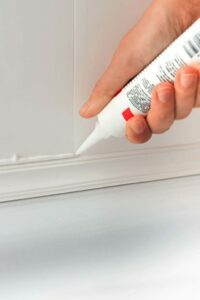 Gawk at your caulk, then give Fix St. Louis a call. Let’s make America grout again.